This year's Citizen of the Year needs little introduction to many in the community. Indeed if there are any residents who haven't heard his name, the odds are still pretty good that they have benefitted from his 40 years of public service in the city, 33 years of which were served on the city council with seven of those years served as mayor. Still, Don Tatzin was surprised to be named Citizen of the Year. "It is humbling," says Tatzin, adding that last year's naming of the community hall at the library after him was more than enough of an honor. Tatzin was born in Cocoa Beach, Florida but has lived in Lafayette since 1976. He earned a bachelor's degree in urban studies and planning as well as a bachelor's in economics and a master's in city planning from MIT, before earning a second master's in economics in Australia, where he worked for a time following his studies. 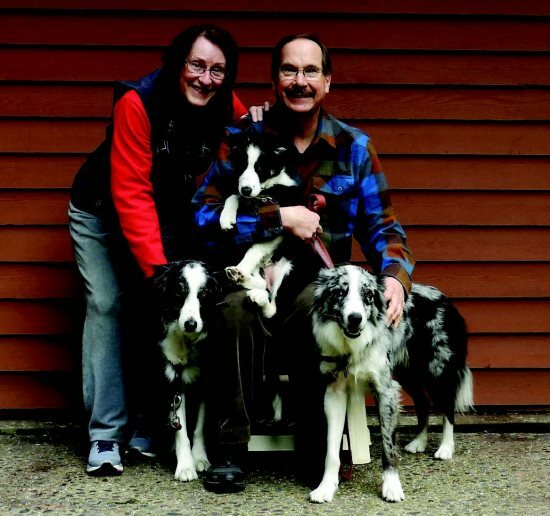 He has been married to his wife Ellen Reintjes since 1982, serving on the city council for 90 percent of that time. He is looking forward to spending more time at home with her. And with his three border collies: Cloud, Greylock and the new puppy, Tenaya. Reintjes says that they are really best friends. "We met when were 18/19 years old. So I look forward to being able to spend more time doing things together - taking longer trips, doing more on the spur of the moment, and trying out new activities." Spare time is not something Tatzin is overly familiar with, however. He was still "commuting" to work in Australia as he began his years of public service, first with the Parks, Trails and Recreation Commission from 1979-94 and then the Planning Commission from 1984-85. Elected to the city council in 1985, Tatzin spent many hours on various local and state boards - the Redevelopment Oversight Board, Lamorinda School Bus Transportation Agency; Lamorinda Fee and Financing Authority; Lamorinda Program Management Committee; Southwest Area Regional Transportation Committee; Contra Costa Transportation Authority; Central Contra Costa Transit Agency; Contra Costa Local Area Formation Commission; San Joaquin Joint Powers Authority; and Marin Clean Energy - all routinely adding up to a minimum of 11 scheduled meetings each week, plus many additional hours spent on preparation. Tatzin's leadership has been a part of all the significant projects completed by the city over the past three decades, including the Lafayette Community Park and Buckeye Fields, the acquisition of Leigh Creekside Park, the deal to acquire the Acalanes Ridge Open Space, the rebuilding of Lafayette Plaza, the Veterans Memorial Building and the new Lafayette police station. 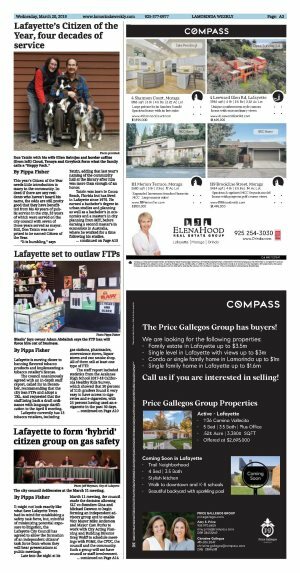 Additionally, as an early member of the Lafayette Community Foundation, Tatzin played a key role in the fiscal planning for the $50 million Lafayette Library and Learning Center. Former City Manager Steve Falk commented that to his mind this was probably both Tatzin's greatest accomplishment as well as his least well known. "His plan not only helped pay for the library but also endowed the Library Foundation with more than $10 million, thus ensuring that the library would not only be built, but also (be) successful for generations." Vice Mayor Mike Anderson notes that Tatzin is a genius with numbers. "I have seen Don calculate returns on compound interests in his head while sitting at the dais. He reads 150-page long annual budgets and auditor reports with a passion," he says. But the message that comes through over and over in talking to those who've worked with him is Tatzin's ability to welcome all and listen to all opinions. Lafayette resident and last year's Citizen of the Year Don Jenkins recalls his first impressions of Tatzin as Oakwood Athletic Club many years ago went through the permit process to build the current club. "In the contentious permitting process I remember Don as one of the councilmen that was able to listen to the citizen rancor for meeting after meeting. He never seemed to be upset and was always courteous to the speakers," says Jenkins, adding, "I admire his a-political approach to city government. I have known Don for perhaps 20 years. He serves as my role model of how I should behave when I want to serve my community. Don exemplifies what citizen politics is in a community ... caring resident/citizens willing to give of their time and talents for the betterment of their community." In addition to fairness and open-mindedness, Reintjes says, "I think Don's greatest talent as a public servant has been his ability to come up with creative and novel approaches to solving problems. He's always been able to tease insights and opportunities out of voluminous amounts of disparate information. Our community has been fortunate that Don devoted this talent to civic endeavors." When asked about what he considers to be his greatest accomplishment over his years on the council, he is modest and quick to point out, "I did nothing alone. 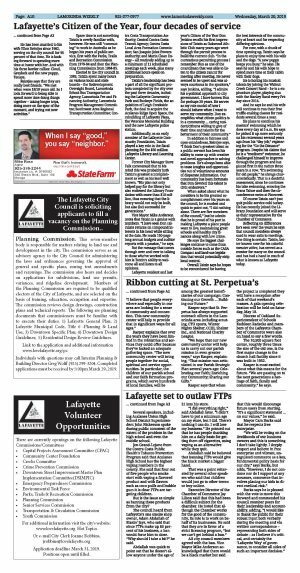 There are five members of the council," but he admits that he is proud of his part in making Lafayette a place people want to live, maintaining great schools and healthy city finances along with low crime. He says the biggest challenges continue to come from outside forces such as the CASA Compact and land-use legislation that would potentially strip local control. Overall Tatzin says he hopes to be remembered for having the best interests of the community at heart and for respecting differing opinions. For now, with a chunk of time opening up, Tatzin says he plans to enjoy time with his wife and the dogs. "A new puppy keeps you busy," he says. He says he and his wife hope to spend more time at their cabin with their dogs. He is honing his musical talents by joining the Walnut Creek Concert Band - he is a euphonium player, playing also with the Stanley Band every Friday since 2014. And he says he and his wife will continue to run their free truffle-making classes for residents several times a year. He plans to continue his masters' swimming which he does every day at 5 a.m. He says he picked it up more seriously on his retirement several years ago from his "day job," registering for the "Go the Distance" program. Despite his claims that he is a "mediocre" swimmer, he challenged himself to improve through the program and has placed first in the nation three years in a row. "It's swimming for old people," he shrugs characteristically. That is a doubtful assessment, since he continues his lake swimming, entering the Trans Tahoe and does the circumference swim at Pinecrest. Of course Tatzin can't just quit public service cold turkey. He has recently joined the Library Foundation and will serve as their representative for the Chamber of Commerce. Reflecting on differences he's seen over the years he says that council members always used to wear suits to meetings. One thing is certain: Tatzin, better known now for his colorful sweater attire, has served as a mentor for many on the council and has had a hand in much of what is known as Lafayette today.